It’s commonly known, of course, how much I love to grow heirloom tomatoes, even to a nutty obsessive degree (some might say). I looooove all those colors and flavors and shapes and whatnot. I’ve been learning from a very patient local garden expert for the past couple of summers, and Gene loves to grow a crazy number of peppers just as much as I love to grow a similarly insane number of heirloom tomatoes. Last summer when he mentioned how many types of peppers that he grew, I was taken aback, but only for a moment. I realized that I was in the presence of a true kindred spirit, and concurrently, I wondered what the big deal was. About peppers. A pepper is a pepper, eh? : I mean, there are big ones and little ones and sweet ones and hot ones . . . but still . . . they’re only peppers, right?? It’s not like you can make killer soup or salsa from them, eh? But then. Everything changed when Gene actually gave me a few dozen (!!) plants that he didn’t have room for, varieties, of course, that I’d never heard of. Such fanciful names—Blushing Beauty–Tequila Sunrise!–Orange Blush–Mariachi?–Shishito–! I was mildly curious about what I’d do with all these peppers, if they actually produced well, but I’m okay with excess. Plus: I hate to make too big of an issue of something as tedious as planning (*cough*) so I wasn’t really concerned. I’d figure out something to do with them, when the time came. I ordered seeds (from here) for a few peppers that caught my fancy, too: Chocolate Beauty–Biquinho–Jimmy Nardello–and so on. So I was in the pepper business, it seemed. Such a happy assortment!! These are the spicy peppers that I am growing this summer. Gentle Reader. 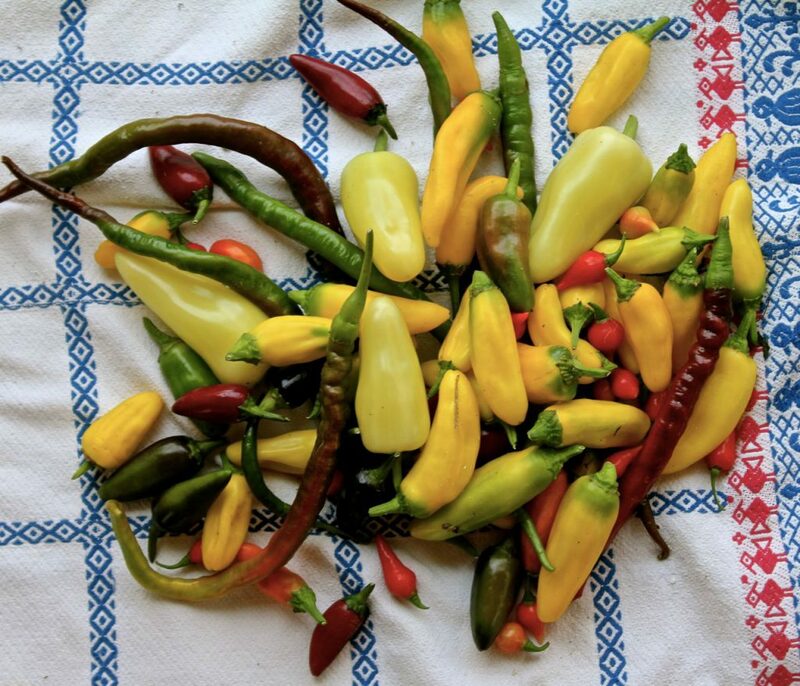 After a couple months of harvesting, enjoying, eating and selling all these peppers, I can say honestly that I am now a convert to the big wide world of pepper adoration. I love, love, love growing peppers. I savor having such a beautiful variety to use in my meals. I love learning how to use each one. I have them in my hoop house and in my garden, and in both places they are doing very well and producing enough for me to sell heaps, and eat plenty, too. They don’t seem to be bothered by bugs. I am now a grow-peppers-in-great-quantities convert. 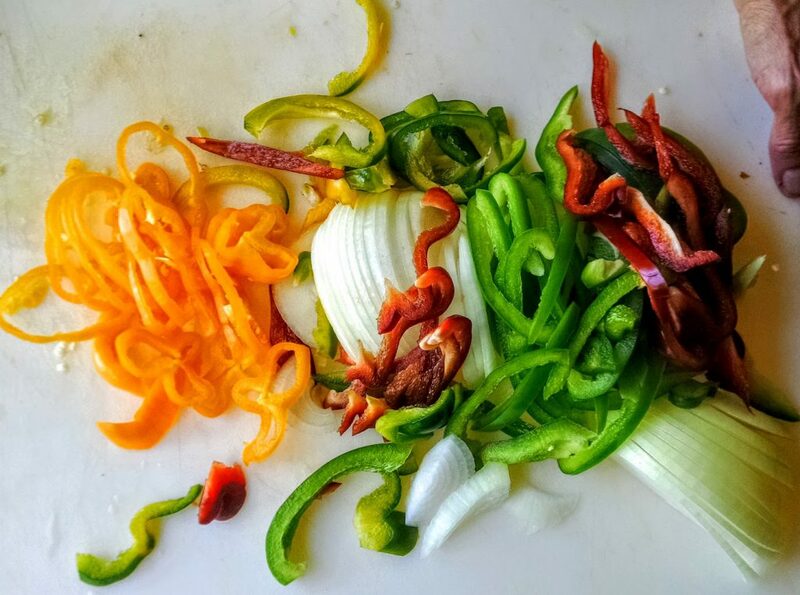 I belong to that club: the I Love Growing Peppers Club. And I believe it’s a lifetime membership, kind of like the membership in the I Love Growing Heirloom Tomatoes Club. I’m a joiner, folks. So . . . without further ado . . (“Further Ado,” I’m convinced, should have been my middle name!) here are my very favorite pepper varieties from this year’s garden. In no particular order. So, so pretty!! So, so misleading! These tiny open-pollinated land-race peppers, originally from Brazil (I’ve been spelling the name of them incorrectly all the blessed summer long, but I think I finally remember how to spell it, since Gene has patiently corrected me approximately 62.5 times) require a lot of patience–the plants stay tiny for sooo long–but they are worth the wait. If you plant them for next year’s garden, be aware that they have a long season before they set fruit–at least 100 days! That’s as long as it takes for a large watermelon to be ready to pick! They need to be planted inside even earlier than your other peppers. They rate very very high in the cuteness meter (which carries a lot of weight for me!). Keep in mind that I am just now picking my first crop, though, and it’s very close to frost (potentially) here in the Midwest. Warning to the Wise Gentle Reader: the first time one of these little cuties turned from pale green to orange, I plucked it and popped it into my mouth. How hot, after all, could it be? It was so little and so darling! Shiny and sweet and colorful, right? Almost like a piece of candy! p.s. I plan to dig up a couple of the smallest biquinho pepper plants in my garden (I do have a couple that are covered with buds but are not fruiting yet, and are still very small) and transplant them into big pots to move to a sunny window inside the house for the winter time. These plants would also make a very pretty patio ornamental plant. Oh, by the way, I got nearly all the seeds for the peppers I planted this year from Baker Creek Heirloom Seeds. Gene purchased pepper seeds from Johnny’s Selected Seeds and Franchi Seeds of Italy. These peppers are real stunners! As you know, I’m selling specialty veg to area chefs this summer, and I’ve sold bushels of peppers, but every single one of these huge burgundy peppers I’ve picked jealously, guarded all the way to the house, and then (promptly!) sliced it up and eaten it. They are very special. They are flat-out gorgeous (obviously! ), thick-walled, very sweet, and with a rich almost-smoky flavor. I just love them. (I’ll grow more next year, and hopefully a few will make it to the kitchens of my favorite chefs). This picture is proof-positive that I did share at least ONE of my chocolate beauty peppers. The dark burgundy one in this photo is a chocolate beauty, and my son Matthew sliced all these up for a dish I made when all the kids were home. I don’t have an individual portrait of this beautiful pepper currently, because I only have two plants (not enough!) and I, er, I mean we eat the peppers as soon as I pick them! But as soon as I actually make it with the camera out to the garden at the right time, I’ll take a picture and get it in here (you’ll have to come back!). Meanwhile, this photo is a fairly good one. Have you spotted a trend yet, Gentle Reader, that pretty carries a lot of weight with me? This pepper is another sweet one that is so stunning. It starts out this lovely cream color, but then as it matures and sweetens, it slowly turns the prettiest orange. I always put a few spicy peppers into my pepper patch, because a. homemade hot sauce!, b. salsa, natch’ c. because they are beautiful and fun to grow, d. homemade chili pepper seasoning. e. So many reasons! These cayennes are outstanding! As you can see in this picture, they are very long, after all, and they produce like crazy. I also enjoy the fanciful shapes they twist and twine themselves into. See how fun gardening can be? Here’s another fun pepper crop that I am enjoying, thanks to Gene: Italian peppers! You can grow all sizes–and I’m learning how to use them. They are terrific grilled, stuffed, sauteed, and of course they score very high on the beauty scale. 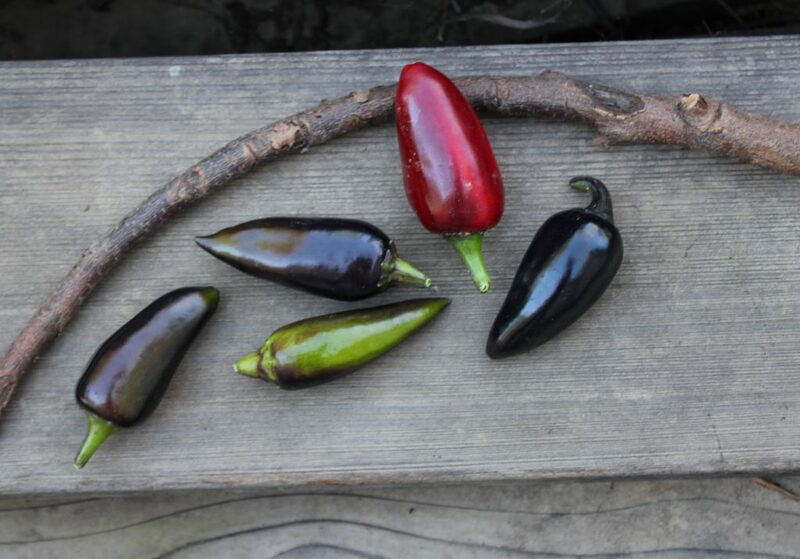 These were some of the earliest peppers that turned color in my garden, too. Early is good, folks, especially when you’re trying to sell produce. The varieties that Gene shared with me that I liked especially well: Cornito Rosso and Cornito Giallo. You can buy seeds for lots of Italian peppers here. Am I the last person in this star system to become acquainted with shishito peppers? It seems that they are very trendy. Moreover, it seems that they’ve been very trendy for some time. I looked online for a recipe on how to prepare them and found this one that mentioned that the shishito was the “biggest new veg of the year!” I was patting myself on the back for actually growing the “best new bite” of the year, contrary to my usual living-under-a-rockness. . . but then. I noticed that the post was from 2013. That’s about right. I’m at least three years behind. But never mind. Now that I know what they are, they’ll be in my garden until I’m too old to remember to put them in. By the way: if you have these in your garden, or are fortunate enough to run across some at your local farmer’s market, this is all you have to do to make a delicious side-dish with them (or an entire meal, as I did one night). Rinse your shishitos. Toss a Tablespoon or so of good olive oil in a heavy skillet and toss the peppers in. Sauté them slowly over medium heat (don’t rush it, it will take a good 15 minutes), stirring often, fending the wildly-hungry folks around you away from them, until they have charred areas and have collapsed. Sprinkle them with sea salt and dish ’em up. Yum, yum, yum. How have I been able to sell these? They are so tasty. 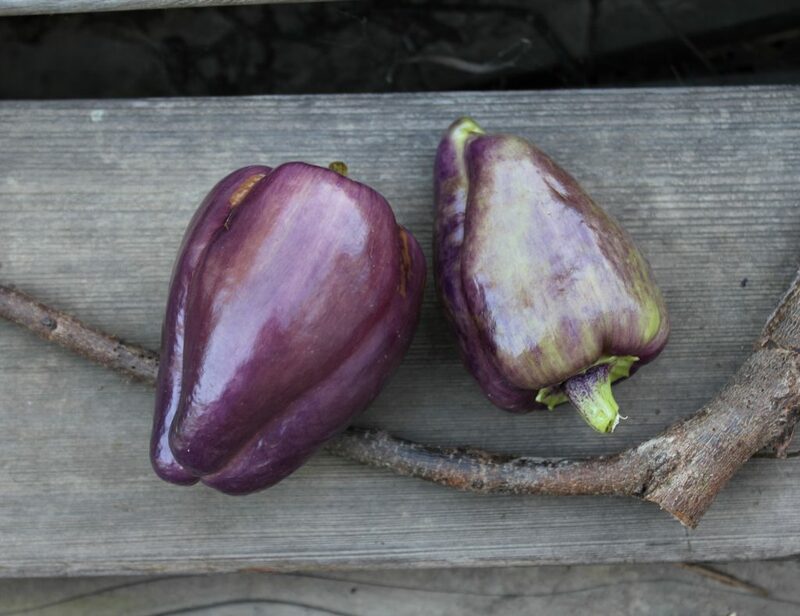 These gorgeous lavender peppers are something special (as you can see!). The plants produce smallish sweet bells like crazy, and the peppers are a delight to the senses: they turn from green, to lavender streaked, to solid lavender and they are sweet and juicy. You can buy the seed here. I always plant several jalapeno pepper plants in my garden, for making chili and salsa and jalapeno poppers! But I do like to try out new types of jalapenos. This one is a winner. Most jalapeno plants produce heavily, and this one is no exception. And the purple fruits that turn to red when completely ripe are beautiful in the garden. Strong, vigorous plants too, and you can get the seeds here. I have enjoyed sharing these new (to me!) favorites with you! Aaaaand what about you? 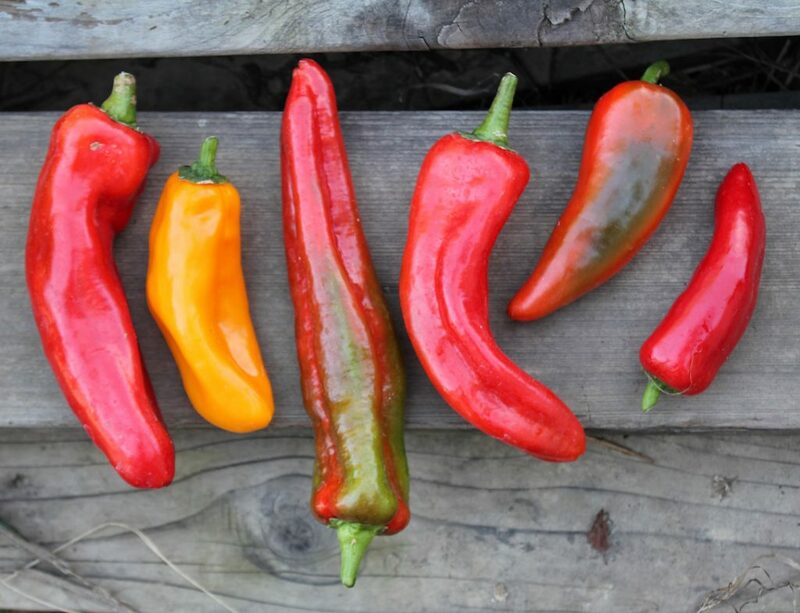 Did you grow any peppers (or any other veg, for that matter) that happened to be an especial delight this year? I’d love to hear about them in the comments. Don’t be shy! Let’s pool our garden experiences this year. I love to hear from you! This story starts a while ago. It’s late spring 2015 and I was using some of the peppers that I had dried from the previous summer when I wondered if the seeds were viable. I took some of them and put them in a wet paper towel. A few days later, there were little roots, so I planted 5 of them in a planter. They all took but it was quite late for such tiny seedlings so my crop came very late. Because there were so many more peppers coming and with frost becoming ever more likely, I took this massive planter into the house. It had to weigh 40 lbs. Well, these pepper plants produced peppers all winter and this spring, 2016, I put it outside again, happy to get it off the window seat in my livingroom. This planter ‘went to town’ growing peppers. Two years of peppers!! They’re hot little devils, most closely resembling your Italians. That brings us to the present. I’m thinking I’ll bring that planter in again to see just how long a pepper plant’s life is. It’s dying back some but there’s new growth closer to the main stocks. Any predictions? Rita, I just love your stories. 🙂 And how savvy you are. I love it that you just lugged that ole’ planter into the house!! Sounds like something I would do. Wait. I have done that. But not for a pepper plant: UNTIL NOW. 😉 This fall I plan to do the same thing, with one of those biquinho plants!! Have you ever brought a tomato plant inside and overwintered it? I’ve done that and plant to do it again this fall. Some years it’s harder to say good-bye to the garden than others!! My prediction: those new shoots will grow up into nice new plants and you’ll be telling me a new chapter of this story in fall of 2017. I love rowing peppers but have stuck to mainly chilli peppers this year as I strugged to ripen sweet ones except some mini ones I’ve found. 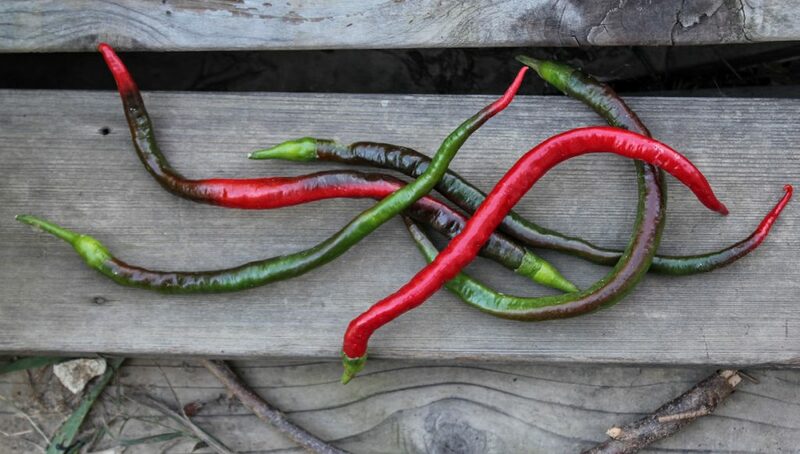 I love cayennes the best but love how th little upright ones look, altogether they are normally pretty hot! I even managed to ripen a few outside this year as well. 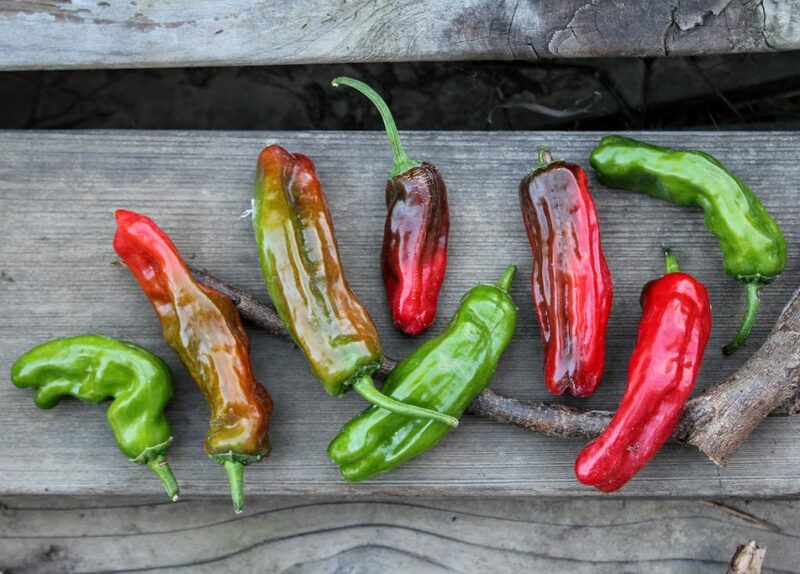 Peppers do have a very long growing season: do you start your seeds indoors? I do, and with their slower-growing habit, it does give them a headstart. Amy, you are so sweet to remember me asking for this post! Now, of course, I will be looking for these varieties next year at your plant sale! I already know that the Chocolate Beauty would be a favorite around our place and I need to jump on the Shishito bandwagon. 🙂 I love my little biquinho plant. It’s doing well and I just tasted the first pepper off of it a couple days ago, luckily I just cut in half and touched it on my tongue. They do have a surprising bit of heat for something so adorable! I never thought of bringing them inside, that would be an easy one to try it on though. They could pass as a Christmas decoration! Thank you, Tina! I’ll be anxious to hear about your favorites next year!! *gasp* Greg! Thank you for catching that! I am not sure how I made that mistake. I couldn’t find the tag for that plant (I think I only have one of them) and there must have been a Tequila Sunrise tag near it. *phew* I changed it. Actually, it was seed I obtained from Baker Creek Heirloom Seeds, called Lilac Bell. Isn’t it pretty? And Cherokee purple tomatoes are outstanding. Like you, my husband Bob and I’ll be growing Shishitos until we’re too old to know what we’re doing. The fall into a category I call them “Pan Peppers” along with the Jimmy Nardello, Sigaretta’s. We fry them in peanut oil with a splash of roasted sesame oil and finish them with soy sauce. 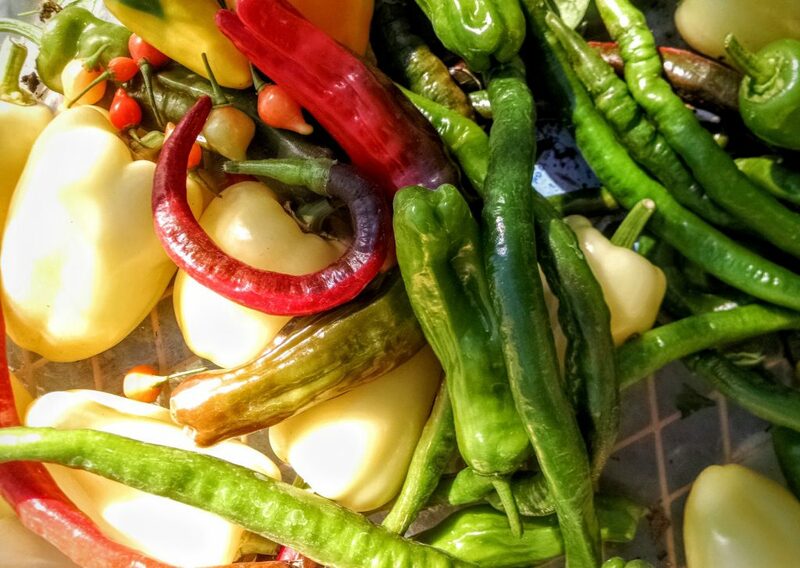 It is our custom to serve them to company as ‘beer peppers’ or alongside any sandwich meal, and keep the leftovers in the fridge to lay on top of burgers and the like. Love your Runza recipe too. I’m cooking up a vegan version for Tuesday. WOW! loved the post. 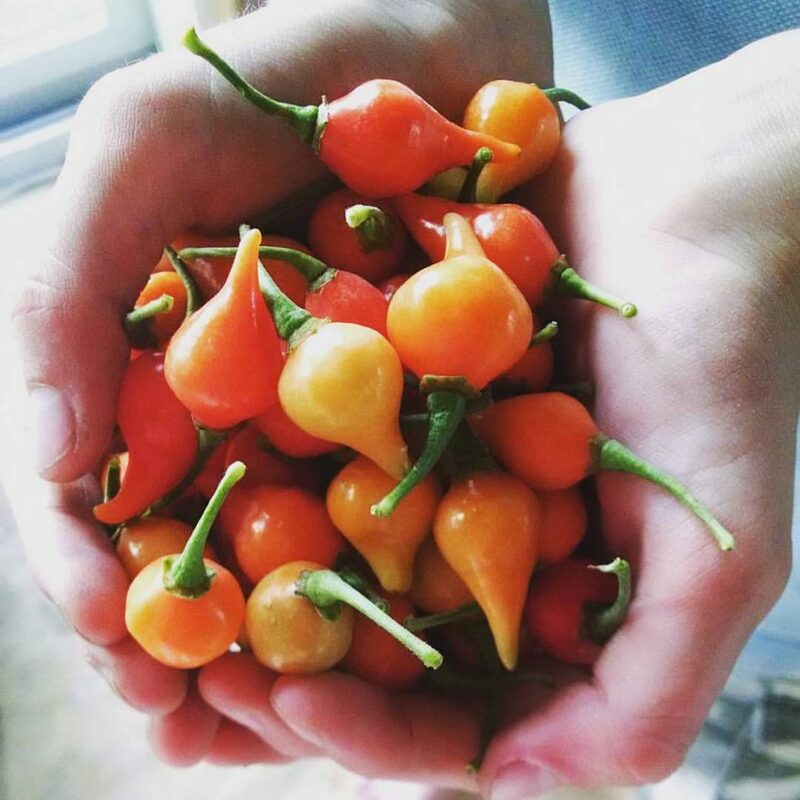 The varieties of pepper you had mentioned in this post are amazing. I loved italian peppers. However, I haven’t heard about “Lilac Bell Pepper” before. Thanks for sharing such information.